CITY CHIC! This gorgeous 825 sq ft condo is located in historic Kaufman Lofts and boasts many recent renovations including pot lights and all new lighting fixtures, new stylish backsplash, beautiful quartz countertops in kitchen and bath, updated kitchen and bathroom cupboards, sink, and tap, shower faucet, new fridge, stove and microwave fan, entire unit has been freshly painted. NOTHING TO DO BUT MOVE IN! This unit features 2 bedrooms, in-suite laundry, polished concrete floors, soaring 13 ft ceilings, rooftop patio with gardens, a terrace and BBQ, 2 PREMIUM PARKING SPACES OWNED (each have approx. $25,000 value), storage locker, floor to ceiling windows and walk-out to private terrace that spans the entire width of the loft and overlooks the sparkling lights of the city. It's located in the HEART OF THE CITY and just steps to shops, cafe's, fantastic restaurants, Communitech, Desire2Learn, the Tannery, the Ion, School of Pharmacy, and much more. ULTIMATE URBAN LIFESTYLE! Open House Saturday April 20th from 2 to 4pm! TUCKED AWAY on a quiet crescent in peaceful Wellesley, this captivating 3 bedroom 3 bathroom home boasts a beautiful curved staircase rising from the 2 storey-high entrance hall, a formal living room/dining room with gleaming hardwood floors that's perfect for hosting intimate meals for friends and family, a large friendly kitchen with abundant counter space and cupboards and open to the warm and cozy family room with gas fireplace. The second level offers 3 spacious bedrooms and 2 baths. Inviting front porch and lovely private yard. You'll love the custom blinds and California shutters, reverse osmosis system, central vac. Roof replaced in 2018. YOUR SEARCH HAS ENDED! URBAN LIFESTYLE! Enjoy the benefits of carefree living in this beautiful condo that features an updated bath, spacious bedroom, attractive, updated and functional kitchen, large living room, newer air conditioner, and walk-out to relaxing balcony with a private view of the city lights. STROLL TO EVERYTHING including the new LRT station being built, many restaurants including the Tannery and Abe Erb, Centre in the Square, The Museum, and the Kitchener Farmer's Market. The condo fees include heat, water and hydro. This building offers a recently renovated lounge, computer area, library and exercise room. This condo is on lease until April 2020 for $1030/month. SPRING IS A NEW BEGINNING....BEGIN HERE! Located minutes from Waterloo in quaint Heidelberg, this charming 3 bedroom home boasts a bright kitchen, large living room, main floor den or bedroom, and 2 or 3 bedrooms up. Entertain family and friends on the large deck overlooking the pretty treed yard. Furnace is one year old. Steel roof. A PARK-LIKE SETTING! Located in desirable Beechwood, this end unit townhouse condo boasts a double garage, 3 spacious bedrooms, inviting ensuite bath, upper floor laundry, separate dining room for hosting intimate meals for friends and family, charming livingroom with cozy fireplace, lots of storage in the kitchen and walk-out to deck overlooking trees and rustic view, large rec room with walk-out to patio. Community Pool. SCENIC SETTING! FAMILY FRIENDLY! Gorgeous 4 bedroom home that boasts a spacious kitchen with lots of counter space and ample cupboards, large movable island that’s perfect for impromptu meals and overlooking the private yard that backs onto the school, warm and welcoming great room with gas fireplace for quiet visits, elegant separate dining room that will welcome your family and friends, and cozy finished basement perfect for the kids. The attractive master bedroom suite has his and hers walk-in closets, and tranquil ensuite. You’ll love the 3 other large bedrooms and bonus sitting area/loft upstairs. Impressive inviting foyer! A SPECIAL PLACE! Open House Wednesday January 30th from 5 to 7pm! THE PRICE IS NICE!! This attractive townhouse condo has a lot to offer the investor or first time home buyer including 3 bedrooms, 2 baths, single garage , finished basement and deck and pretty yard. Desirable Forest Heights location close to trails, shopping, restaurants and transportation. Upper unit. RARE FIND! This gorgeous commercial condo features 1605 sq ft plus a large storage locker, cooler and bathroom. This lovely shop is in pristine condition and boasts a highly visible location in the heart of the Village. Call or email realtor for info. DO NOT GO DIRECT. Business and inventory also available for sale for an additional $125,000. SUNLIT SANCTUARY! Located in desirable Westvale, this pretty bungalow boasts a welcoming front porch, bright, efficiently designed kitchen with ample storage and counter space, contemporary great room with large windows, high ceilings and skylight, gas fireplace, and walk-out to deck and beautifully landscaped yard and tranquil pond. There are 2 bedrooms, 2 baths, a finished rec room, and a workshop. Most windows replaced. MAKE YOUR MOVE! Taxes $3,384/2018. YOUR ATTENTION, PLEASE! This elegant 4 bedroom, 4 bath home is beautifully decorated and ready to move in to. The living room and dining room boast gleaming hardwood floors, as well as the family room which features a dramatic sloped ceiling and gas fireplace. You'll love the large friendly kitchen with lots of space for your family to gather for meals and features sliders to upper deck and patio. The double garage is heated and enters into the mudroom/laundry room with newer washer and dryer. The rec room is perfect for a pool table, parties and hobbies and features a walk-out to patio, sparkling pool, and lots of room to entertain or relax. SPACE AND SUNSHINE! Lot size 45.90 Ft x 122.21 Ft. Taxes $3,803/2018. FRONT PORCH CHARM! This beautiful century home is in great condition and boasts hardwood floors, original doors and lots of character, spacious dining room/family room perfect for entertaining family and friends, large eat-in kitchen with sliders to inviting deck, hot tub, and huge private yard with lovely landscaping, convenient mudroom, main floor 4 piece bath and laundry room, finished rec room, 3 bedrooms and 2 piece bath upstairs. High efficiency gas furnace and water softener installed in 2017. Hobbyists will love the detached garage/shed (26'2 x 29'6) that has a gas furnace and water, and large concrete driveway with lots of parking. CHARM WITH A CAPITAL "SEE"! Taxes $2,398/2018. URBAN LIFESTYLE! Enjoy the benefits of carefree living in this beautiful condo that features a pretty updated bath, spacious bedroom, attractive and functional kitchen, large living room and walk-out to relaxing balcony with a private view of the city lights. Included with this condo is one UNDERGROUND PARKING spot! STROLL TO EVERYTHING including the new LRT station being built, many restaurants including the Tannery and Abe Erb, Centre in the Square, The Museum, and the Kitchener Farmer's Market. The condo fees include heat, water and hydro. This building offers a recently renovated lounge, computer area, library and exercise room. Immaculate, updated and READY TO MOVE INTO! Taxes $1,181/2018. BIG YARD - QUIET STREET! ENJOY QUIET RELAXING SURROUNDINGS in pastoral Millbank. This charming one-owner home has been lovingly maintained and boasts a spacious living room with huge picture window to let the sun in, large eat-in kitchen with ample space for entertaining family and friends, and walk-out to deck with picturebook setting of lawn, vegetable gardens and spacious shed, finished rec room with wood fireplace. Enjoy the taste of vegetables fresh from your garden. Features attached garage and workshop and electrical is wired for a generator. Roof 2010, central vac 2013, hot water heater 2015. GET SETTLED BEFORE SCHOOL STARTS! Taxes $2,323/2018. Lot size 75.00 Ft x 132.00 Ft.
CITY SCAPE! Enjoy the benefits of carefree living in this beautiful condo that features a pretty updated bath, spacious bedroom, attractive and functional kitchen, large living room and walk-out to relaxing balcony with a private view of the city lights. STROLL TO EVERYTHING including the new LRT station being built, many restaurants including the Tannery and Abe Erb, Centre in the Square, The Museum, and the Kitchener Farmer's Market. The condo fees include heat, water and hydro. This building offers a recently renovated lounge, computer area, library and exercise room. Tenant leaving August 31st. Need at least 30 hours notice for viewings. ENJOY QUIET RELAXING SURROUNDINGS IN THIS ESTABLISHED NEIGHBOURHOOD in tranquil Wellesley. This charming one-owner home has been lovingly maintained and boasts a main floor master bedroom, bright and sunny sunroom addition, finished basement with gas woodstove and walk-out to patio with picturebook setting of lawn, pond, gardens and grounds and spacious shed. Located on a double lot close to the school and library. Lot size 115.50 Ft x 100 Ft. Taxes $2,677/2018. ALL THIS CAN BE YOURS! Located close to schools and shopping in the popular Williamsburg area, this gorgeous 1790 sq ft home boasts 3 baths and 3 bedrooms, convenient upper floor laundry, warm and welcoming upper floor family room with gas fireplace, sloped high ceiling and pretty accent window, spacious great room with fireplace open to the dining area and kitchen boasting ample storage and counter space and an island offering a cosy breakfast or snack nook, and sliders to the deck overlooking the picturebook setting of lawn, fruit trees, garden, grounds and hot tub for relaxing and unwinding. PRIVATE, PEACEFUL AND PERFECT! SUN-SATIONAL! This spacious, light and airy home will captivate you with its gorgeous kitchen with stylish countertops, large island with ample storage and walk-out to deck and pretty yard, elegant great room with gas fireplace and engineered hardwood flooring, impressive master suite boasts spa bath and lots of storage, finished basement with large windows to let the sun in, 2 bedrooms and bath. Built in 2017 this almost new home is located in a mature, treed neighbourhood. This is truly A SPECIAL PLACE! A PARK-LIKE SETTING! This warm and welcoming 4 bedroom, 4 bath home features a finished basement that’s perfect for a pool table, family gatherings and hobbies, pretty kitchen with granite counter tops open to the family room with gas fireplace and walkout to deck and impressive secluded yard (that extends well into the bush) with rolling lawn, trees and perennials to provide peaceful relaxation –NO NEIGHBOURS BEHIND! The main floor and second floor hallway boasts hardwood floors, second floor laundry, and you will love to relax in the lavish ensuite bath with heated floors, glass shower stall and inviting jacuzzi tub. This stunning home has many updates including the deck in 2015, rec room and basement bath in 2016, Lennox’s most efficient furnace and high eff A/C, Pure Air Purification system and Smart Thermostat in 2017, dishwasher in 2017, attic and garage insulated in 2017, gutter guards in 2017, 4 piece bath updated in 2015, Ensuite, Walk in Closet, Main floor bathroom, California ceiling on main floor, front door, lights, all in 2013. YOUR SEARCH HAS ENDED! Lot size 49.22 Ft x 199.27 Ft. Taxes $3,970/2017. FAMILY FRIENDLY! Need more space? You'll find it in this beautiful 3 bedroom, 3 bath home boasting an open concept main floor and a huge family room with cozy gas fireplace and walk-out to deck and pretty yard, cathedral ceilings in the bright dining room and kitchen, main floor laundry room, mostly finished basement perfect for hobbies and games. Conveniently located across from a park in a desirable neighbourhood close to schools and shops. THERE'S NO PLACE LIKE HOME! Lot size 34.78 Ft x 108.42 Ft. Taxes $3,268/2017. STROH HOMES PROUDLY PRESENTS this gorgeous 1795 sq ft semi-detached home that's located on a large lot on a quiet cul-de-sac. It features a walk-out basement overlooking gorgeous sunsets and scenic view of the Nith River and rolling countryside. PREMIUM LOT!! The master bedroom boasts a walk-in closet and luxurious ensuite bath. You'll love the dream kitchen with granite counter tops and walk-out from dinette to relaxing covered deck. EXCITINGLY NEW! Also available for rent $1250 all inclusive! CITY SCAPE! Enjoy the benefits of carefree living in this beautiful condo that features a pretty updated bath, spacious bedroom, attractive and functional kitchen, large living room and walk-out to relaxing balcony with a private view of the city lights. STROLL TO EVERYTHING including the new LRT station being built, many restaurants including the Tannery and Abe Erb, Centre in the Square, The Museum, and the Kitchener Farmer's Market. This building offers a recently renovated lounge, computer area, library and exercise room. READY TO MOVE INTO! Taxes $1,132/2017. Condo fees are $560.38 and include building insurance, common elements, exterior maintenance, heat, hydro, water. URBAN FLAVOUR! Located in the historic Kaufman Loft's, this stylish Soho condo features polished concrete floors, soaring concrete ceilings, huge windows overlooking the courtyard, spacious walk-in closet in large master bedroom, corian counter tops and under counter lighting. It's located in the HEART OF THE CITY and just steps to shops, cafe's, fantastic restaurants, Communitech, Desire2Learn, the Tannery, the Ion, School of Pharmacy, and much more. THE VERY "NOW"EST! Taxes $2,115/2017. YOU'VE JUST RUN OUT OF REASONS TO RENT! Located close to uptown Waterloo, transportation, grocery stores and shopping, this spacious condo boasts lots of storage, separate dining room, 2 bedrooms, and walkout to large balcony. There's one covered parking spot, lots of visitor parking, and a gorgeous view. The condo fees include all utilities. THE ULTIMATE IN CAREFREE LIVING! Taxes $1,865/2017. Condo fees $552.68 and include building insurance, central air conditioning, common elements, exterior maintenance, heat, hydro, natural gas, parking, water. ULTIMATE URBAN LIFESTYLE! This charming Soho condo boasts a New York style balcony overlooking the courtyard in historic Kaufman Loft's. There's 1 owned parking spot and a storage locker on the same floor as the condo and it features polished concrete floors, and soaring 13 ft ceilings. Located in the HEART OF THE CITY and just steps to shops, cafe's, fantastic restaurants, Communitech, Desire2Learn, The Tannery, the ION, School of Pharmacy, and much more. Taxes $2,115/2017. WELCOME HOME to this beautiful brick back-split home with double garage and located in a desirable family-friendly neighbourhood. This one owner home has been meticulously maintained and boasts a spacious eat-in kitchen with lots of cupboards and counter space. The kitchen has a walk-out to an inviting covered deck that's great for barbequing and a large sunny backyard with a colourful palette of flowers and perennials. The family room features a cozy gas fireplace and there are 2 full baths and 4 bedrooms. The formal living room and dining room are perfect for entertaining friends and family. THERE'S NO PLACE LIKE HOME! Taxes $3,855/2017 and property 50.52 Ft x 118.11 Ft. Enjoy quiet relaxing surroundings at this elegant 2 bedroom bungalow with double garage. Experience the joy of cooking in the beautifully updated kitchen with granite counter tops and island eating bar for impromptu meals or buffet service. The great room features a cozy gas fireplace and walk-out to newer deck and lovely manicured yard. The sophisticated master ensuite bath features heated floors and walk-in tub. This end unit freehold townhome boasts many updates and is in move-in condition. RARE FIND! Lot size 31.53 ft x 150.92 ft and taxes $3,359/2017. PRECIOUS MEMORIES BEGIN HERE! This spacious and attractive 3+ bedroom bungalow boasts a huge kitchen with lots of cupboards, the large dining room offers the perfect setting to invite the family for Sunday dinner, inviting rec room and games room downstairs, attached double garage and private treed yard. The master bedroom features a 2 piece ensuite, and there is much more in this sunny and welcoming home. THERE'S NO PLACE LIKE HOME! Lot size 75.46 Ft x112.67. Taxes $2,948/2017. FRAME THE VIEW! Retreat to this captivating bungalow located on 6.64 acres just minutes from Kitchener. This country estate boasts trails, streams, towering trees, a pond, hot tub and sparkling in-ground salt- water infinity pool. You'll love the spacious newer kitchen open to the dining room with gas fireplace and sliders to a large deck overlooking the wooded setting. The lower level boasts 2 bedrooms, bath, studio, storage room and welcoming family room with gas wood stove and walk-out to hot tub and patio and unparalleled view of singing pines and pond. PARADISE FOUND! Taxes $6,161/2017 lot size 618.01 ft x 414.26 ft.
BEAUTIFUL START! This lovely home has much to offer including 3 bedrooms, 2 full baths, spacious kitchen with lots of cupboards, dinette has sliders to 2 level deck and private treed yard, spacious family room features gas fireplace, plus lower level has lots of space for a rec room or storage, single garage with new garage door. 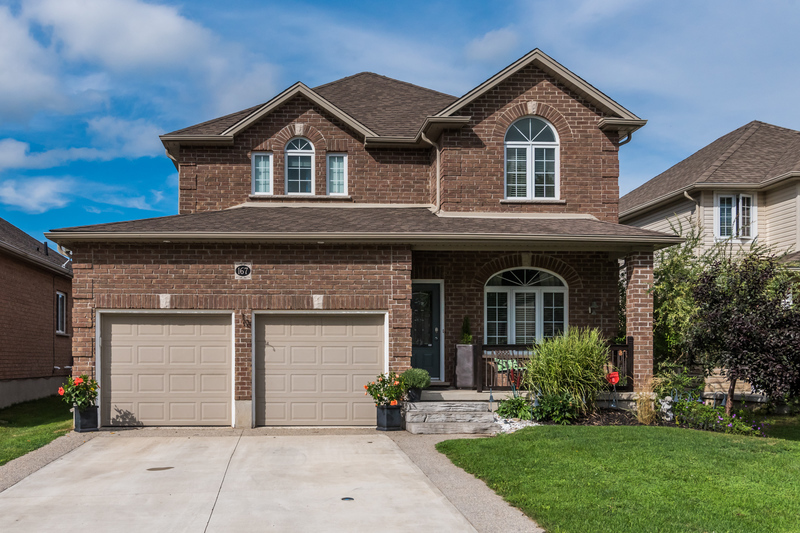 Located on a family friendly crescent close to schools, shopping and transportation. Beautifully decorated and ready to move in to. CHARM WITH A CAPITAL 'SEE'! Taxes $3,005/2017 lot size 24.02 ft x 106.65 ft.
AGE OLD ELEGANCE! This magnificent century home was built circa 1870 and features a welcoming veranda, pretty sitting room/den, bright living room with gas fireplace and large dining room offering the perfect setting to invite the family for an old-fashioned Christmas dinner. Original wood flooring provides an attractive contrast to the white kitchen and corian counter tops. Relax in the charming sunroom addition that overlooks the tranquil and treed yard with gazebo and many perennials. There's a convenient pantry off the kitchen, 3 piece bath and spacious family room. Upstairs, you will find a second bath, 4 bedrooms and a sunny sewing room. Hobbyists will be impressed with the 2 storey garage addition and workshop. Located in the highly desirable MacGregor Albert Heritage District that is close to Waterloo Park, Uptown Waterloo, MacGregor, WCI and the universities. A PICTURESQUE PIECE OF HISTORY! Property taxes $4,761/2017. YOUR ATTENTION, PLEASE! This beautiful home boasts 4 spacious bedrooms with large closets, bright living room and dining room with lots of space for entertaining, lovely updated kitchen, dinette with walk-out to deck and private treed yard, warm and welcoming rec room with fireplace. This home is beautifully decorated and in move-in condition and has many updates including the roof, garage door, most windows, flooring, water softener, and freshly painted. Located on a tranquil Waterloo street close to Laurel Creek Conservation, schools, shopping and transportation. FAMILY FRIENDLY! Property taxes $3,622/2017. CELEBRATE NATURE! Your family will be captivated by this gorgeous home with 1 1/2 garage and boasting a spacious kitchen with loads of storage and cupboards, separate dining room perfect for Sunday brunch, living room with cozy wood fireplace and family room featuring walk-out to lovely flagstone terrace and overlooking the beautiful trails, stately trees and grounds that are part of this one of a kind property. Finished rec room, bedroom/office and bath complete the basement. The master bedroom has an inviting ensuite and overlooks a sunroom that is equipped for a hot tub. There are an additional 2 spacious bedrooms -one with a charming balcony with private view of natural woodsy yard. Located in a desirable family-friendly area across from a park. PICTUREBOOK SETTING! Taxes $4,077/2017. CAPTIVATING CONDO located in the heart of the city at historic Kaufman lofts with polished original concrete floors, 13 1/2" ceilings and soaring windows overlooking the city. The storage unit is located on the same floor, and there's easy access to the roof-top patio. CHANGE YOUR LIFE WITH STYLE! Taxes $2,253/2017 and condo fees $375 and include building insurance, central air conditioning, common elements, exterior maintenance, heat, parking, water. GET SETTLED BEFORE SCHOOL STARTS! Located on a quiet, family friendly crescent in tranquil Wellesley, this gorgeous 4 bedroom home boasts a 1 and 1/2 car garage with double driveway and entry to mud/laundry room, attractive and spacious kitchen with lots of storage and open to dining room and relaxing family room. The master bedroom features a large walk-in closet and inviting ensuite bath. The huge sunny yard offers room for anything -kids, pets, and a vegetable garden! BIG YARD -QUIET STREET! EXPLORE THE PAST with " this OLDE HOUSE" located on a huge private lot in quaint Wellesley. This beautiful and charming brick home features 3 bedrooms and 2 updated baths, large eat-in kitchen with lots of cupboards, gorgeous wood floors, main floor laundry, convenient mudroom addition in 2014 with walk-out to deck overlooking picturebook setting of rolling lawns, gardens and grounds. Roof replaced in 2013, gas furnace 2012 and shed 2013. ONE OF A KIND! LOVE BIG, OLD HOMES? Then you will want to see this gorgeous home boasting a huge wrap-around veranda that's perfect for sipping lemonade on a hot summer afternoon, airy and open foyer, hardwood floors and large windows to let the sun in, welcoming dining room with gas fireplace, high ceilings and pretty kitchen. The are 3 bedrooms and 2 full updated baths, and the attic is finished beautifully with engineered hardwood flooring and used as a family room. Detached garage with workshop and big driveway. MAGNIFICENT! Lot size 55 x 132 and taxes $3,620/2016. ATTENTION FIRST TIME BUYERS AND INVESTORS! This 1000 sq ft condo boasts 2 bedrooms, 5 year old kitchen, spacious balcony overlooking the pool and pretty view. Conveniently located near the expressway, 401, new LRT, restaurants and shopping. The building boasts many features including a party room, fitness room, and sauna. $1,418/2017 taxes. LET REAL ESTATE WORK FOR YOU! Located in the desirable East Ward, this beautiful brick home is currently used as a duplex and boasts a charming upper floor apartment with 3 bedrooms, hardwood floors, walk-up attic, and lovely covered porch. The main floor has one or two bedrooms, separate dining room, dressing room, amd walk-out to gorgeous private patio and detached double garage. This home could easily be converted back to a single family home.Taxes $3,500/2017. GREAT BEGINNINGS! Talked away on a quiet family- friendly crescent, this 3 bedroom semi-detached home has lots to offer including 2 baths, hardwood floors and ceramics on main floor, beautiful laminate flooring upstairs, finished rec room and walk-out to large deck and pretty, private yard. THERE'S NO PLACE LIKE HOME! OPEN HOUSE SUNDAY 2:00-4:00! TREAT YOURSELF AND YOUR FAMILY to this stunning 4 bedroom home desirably located on a quiet street and boasting a spacious double car garage, huge exposed aggregate concrete driveway large enough for your friends and family, spacious and airy foyer, separate dining room for easy entertaining, welcoming living room, a sleek and stylish kitchen with granite counter tops and ample cupboards open to the family room with gas fireplace and walk-out to a large,pretty yard. You'll love the master suite that features a luxurious bathroom with inviting soaker tub and glass shower and walk-in closet. There's plenty of space offered with 3 more bedrooms and a bath. Water softener, reverse osmosis water system, engineered hardwood and ceramic floors, much more. BEAUTIFULLY DECORATED AND READY TO MOVE IN TO! CHANGE YOUR LIFE WITH STYLE at the highly desirable FOXBORO GREEN Adult Lifestyle Community. This bright and beautiful bungalow boasts ceramics and hardwood floors, California shutters, separate dining room for entertaining family and friends, open and airy great room with sloped ceilings, pretty, updated kitchen with walk-out to newer deck and tranquil view of golf course. The basement offers plenty of room for hobbies, another bath, and a rec room. Enjoy the amazing sunsets, walking trails, tennis court, pool and hot tub, gym, and SO MUCH MORE! SCENICALLY SUPREME! Taxes $3,265/2017. CAPTIVATING CONDO! This attractive 1100 sq ft home boasts an over-sized storage locker, spacious master bedroom with large walk-in closet, 2nd bright bedroom, huge great room open to the kitchen, and balcony overlooking the pond, park and beautiful sunsets. CHANGE YOUR LIFE WITH STYLE! Taxes $2,197/2017. LARGER THAN IT LOOKS! WARM AND WELCOMING 3+ bedroom brick bungalow boasts double garage, pretty updated kitchen with sloped ceilings and loads of cupboards, lovely dinette and garden doors to deck and large beautifully landscaped yard, gracious family room/dining room with gas fireplace, den and bright living room for formal entertaining. The tranquil master bedroom overlooks the yard and features a spacious ensuite and walk-in closet. Your family will love the huge finished basement with hobby room/games room, rec room with gas fireplace, a fourth bedroom and 3 piece bath. This is a spacious and sunlit home in move-in condition! Appliances, hot water heater, water softener are all owned and included. YOUR SEARCH HAS ENDED! Taxes $3,833/2017. LET REAL ESTATE WORK FOR YOU! Loaded with character and charm, this legal non-conforming duplex is currently rented on a month-to-month basis. The upstairs unit is rented for $1020 plus hydro and boasts a charming walk-up attic, sunroom overlooking the neighbourhood, and 2 bedrooms. The main floor unit is rented for $913.50 plus hydro and has 2 baths and 2 bedrooms, or one bedroom and a dining room. Pictures of main floor unit were taken before it was rented. Taxes 2,981/2017. BEAUTIFUL START! This charming 1 and 1/2 storey home boasts hardwood floors, bright and spacious living room, formal dining room that's perfect for relaxing family dinners, 2 full baths, 2 main floor bedrooms, and another bedroom and family room upstairs. The basement offers a potential in-law suite with a separate entrance. It's located on a quiet street that's close to both uptown Waterloo and downtown Kitchener, the expressway, parks, schools and churches, and features a large garden shed and private yard. WARM AND WELCOMING! OPEN HOUSE SUNDAY 2:00-4:00! THE ULTIMATE IN CAREFREE LIVING! Located in the retirement village in Wellesley, this bright and beautiful townhouse condo boasts 2 bedrooms, 2 baths, single garage. You’ll love the bright kitchen with pantry and pullout drawers, spacious dining area and large living room with warm gas fireplace and garden doors to a pretty and private deck. RARE FIND! ENJOY THE PEACE AND QUIET OFFERED at Morningside Retirement Village! You will love the carefree lifestyle offered with the rec centre, pool, library, workshops and social outings! This lovely Sheffield model offers an open concept living room with cozy wood fireplace, separate dining room for elegant family get togethers, bright and inviting sunroom overlooking the deck and gorgeous trees, eat-in kitchen with large windows and large closet containing storage and laundry center, spare bedroom and full bath, master suite boasts large walk-in closet and pretty ensuite, 1 and half car garage, central air conditioning, much more! Most windows, furnace, and air replaced in summer of 2014. Roof replaced in 2008. TAKE LIFE EASY! GREAT BEGINNINGS! Lovely 3 bedroom bungalow with garage boasts gorgeous updated kitchen overlooking large, private yard with deck, spacious living room with large bright windows and lots of room to entertain, 2 full baths, huge, inviting rec room with rustic fireplace, and exercise/games room. NO CARPETS! TASTEFULLY DECORATED AND READY TO MOVE IN TO! Taxes $3,367/2016. A SPECIAL PLACE! This elegant freehold townhome boasts a gorgeous kitchen with granite counter tops open to the great room with gas fireplace and soaring ceilings to second floor loft. The great room and finished basement both walk out to amazing yard overlooking trees and pond. SCENICALLY SUPREME! TUCKED AWAY ON A QUIET CUL-DE-SAC, this gorgeous 4+ bedroom home boasts a dream kitchen that will look great against your groceries with granite counter tops and ample cupboards, in-floor heating, beautiful stone feature wall and bright eating area overlooking the private yard, spacious great room with gas fireplace, elegant hardwood floors and sloped ceiling, spacious separate dining room that will welcome your family and friends, large living room/office, finished basement. The attractive master bedroom suite has a his and hers walk-in closets, sloped ceiling and spa-like ensuite. This family friendly home is desirably located in Eastbridge and has in-floor heating, central vac and a lawn sprinkler system.Taxes $5,021/2016. DON'T BE A RENT SLAVE! You'll love the convenience, privacy and security offered at this beautiful 2 bedroom corner unit apartment condo, featuring hardwood parquet flooring, separate dining room, spacious balcony and large storage closet. There have been many updates including the fridge and stove, some light fixtures, painting, tiling in the kitchen and more. Great investment opportunity. Located close to shopping, restaurants and the 7 and 8. JUST MOVE IN AND ENJOY! Taxes $1,321/2016. LOOKING FOR A TREE-LINED STREET? Located in prime Westvale in Waterloo, this spacious and airy home boasts a picturesque private yard with shed and lovely landscaping, cozy finished rec room with 3 piece bath and in-floor heating, 2 storey living room, bright kitchen with space for a dinette, and dining room with huge picture window. THERE'S NO PLACE LIKE HOME! Lot 33.46 Feet x 119.75 Feet and 2016 taxes are $3,061. CELEBRATE NATURE! Tucked away on a quiet treed street in peaceful St Clements, this charming bungalow boasts a separate garage/shed that's perfect for car enthusiasts! The 2 or 3 bedroom home has a large family room with gas fireplace, updated bathroom, spacious kitchen, central air, central vac and new roof. Relax and enjoy summer on the secluded deck overlooking the huge 275 foot lot! 2016 taxes $3,146. FAMILY FRIENDLY! Treat yourself and your family to this stunning 4 bedroom home boasting 2 master suites, upstairs laundry, spacious family room open to the gorgeous staircase, and study or office. Experience the joy of cooking in this fully-equipped kitchen with built-in appliances including 2 ovens, wine fridge, huge pantry, and dinette. There's a large separate dining room for easy entertaining. Hobbyists will appreciate the 9'9" x 7'4" workshop behind the double garage. Relax and enjoy the deck and private yard. Lot size 74.77 Feet x 153.94 Fee. 2015 taxes $4,318. HERE'S BUYING POWER! Located on a large treed lot, this bungalow boasts a double garage and separate garage, large kitchen and 2 large bedrooms. BRING BACK THE SPARKLE...and you will have made a smart investment. Property sold "as is". A PARK-LIKE SETTING! This one-owner home will impress you with the welcoming family room with gas fireplace and walk-out to deck, updated kitchen and dinette with bay window overlooking the treed and tranquil yard, elegant living room with large picture window, 3 bedrooms, 2 full baths and finished rec room that's handy for hobbies or the perfect playroom for the little people. Furnace replaced in September 2014. Enjoy the taste of vegetables fresh from your garden. You will be captivated by this one of a kind property boasting rolling greens, gardens and shade trees. Taxes are 2015/$3,502.1,667 square feet. A HOME WITH DRAMATIC FLAIR! 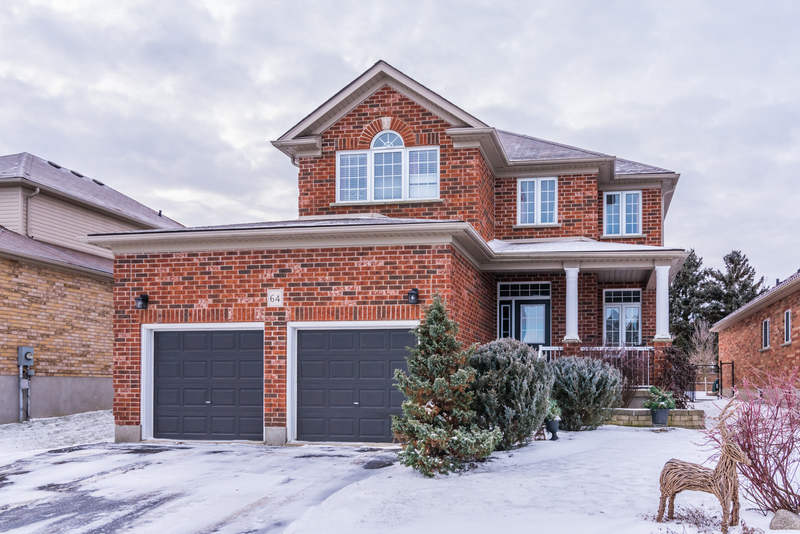 Desirably located in Carriage Crossing, this captivating townhouse features a soaring 2 storey foyer and beautiful split entry staircase leading to the gracious great room with gas fireplace, eating area and magnificent kitchen. You'll love the second storey den that overlooks the staircase. The master bedroom features an inviting and luxurious spa ensuite and walk-in closet. There are many special details and upgrades including California shutters, granite counter tops, bleached engineered hardwood floors, porcelain floors, and a picturesque yard with maintenance free deck and stone patio. NO NEIGHBOURS BEHIND! Taxes are $5,103/2015. OPEN HOUSE SUNDAY 2:00-4:00! STROH HOMES PROUDLY PRESENTS this elegant 1585 sq ft bungalow with triple garage boasting an open-concept great room with gas fireplace, walk-out to covered deck, gorgeous kitchen with granite counter tops and pantry with pull-out drawers, large master bedroom with convenient walk-in closet and luxury ensuite bath, and finished basement with rec room with fireplace, bedroom and full bath. Staircase from garage to basement, central air, air exchanger, much more! Virtual Tour to come! HOUSE AND GARDEN! Desirably located in Maple Hills, this charming 5 bedroom home boasts a spacious and welcoming foyer, gracious living room and formal dining room for easy entertaining, lovely updated kitchen with quartz countertops and plenty of storage, warm and inviting family room with built-in bookshelves, gas fireplace and walk-out to covered patio overlooking the huge picturesque yard and sparkling salt-water pool. You'll love the large master bedroom with in-floor heating, gas fireplace, private bath and walk-out to private balcony to enjoy your early morning coffee. There are 4 other spacious bedrooms and one features its own ensuite bath. The finished rec room is perfect for a pool table, parties, hobbies or exercise room. This gorgeous home has been extensively updated including replacing all the windows. JUST MOVE IN AND ENJOY! OPEN HOUSE SUNDAY 2:00-4:00! STROH HOMES PROUDLY PRESENTS this absolutely gorgeous 2058 sq ft bungalow with an outstanding kitchen featuring granite counter tops, huge island, spacious dinette with garden doors to a private covered porch, tranquil master retreat with inviting master spa bath with deep soaker tub, river rock in large shower, tumbled travertine marble heated floor. You'll love the spacious finished basement with 2 bedrooms, bath and bright family room. IT'S A SHOWPIECE! Virtual tour to come. Triple garage with stairs to basement. SEE YOU ON SUNDAY! CONVENIENCE, PRIVACY AND SECURITY can all be found in this beautiful and unique condo boasting a spacious and airy master bedroom with ensuite bath and lots of wardrobe space, and den or office overlooking the HEART OF THE CITY, pretty kitchen with lots of cupboards, utility and laundry room, sunny great room and second bath. It's just steps to the Centre in the Square, the Farmer's Market, library, museum and everything you want! It boasts underground parking, air conditioning, and convenient in-suite laundry. CAREFREE LIVING CAN BE YOURS! Fridge, stove, washer and dryer, included. NO RENTALS! Monthly fee is $435 and includes everything but hydro, which is approximately $50/mo. Storage locker G51 paid until 2017. Quick closing possible. CITY CHIC! This sunlit penthouse loft boasts soaring open spaces and floor to ceiling windows overlooking the sparkling lights of the city! Enjoy the spacious master bedroom with walk-in closet and luxurious ensuite bath. The gorgeous kitchen boasts granite counters, pantry and island open to the great room, dining room and den. Another bedroom and full bath are part of the 1140 sq ft. Relax on the huge patio. 2 premium parking spots, 4 x 8 storage locker (117), and a 600 square foot hobby room are owned! THE VERY 'NOWEST'! STROH HOMES PROUDLY PRESENTS this outstanding 1872 sq ft bungalow with triple garage boasting a gorgeous kitchen with custom white shaker cabinets, black granite counters and gray porcelain floors, spacious dinette overlooking the deck and pretty yard, great room with 11 foot ceilings, gas fireplace and quartet oak flooring, beautiful master bedroom with luxury spa bath and huge walk-in closet. The basement is warm and welcoming with a large recreation/games room, stone gas fireplace, and 2 bedrooms and full bath. It boasts central air conditioning, air exchanger, and staircase from garage to basement. JUST FINISHED AND READY TO MOVE IN TO! Lot size is 62.110X128.61 and taxes are not set. OVERLOOKING THE BEAUTIFUL TRAILS AND GROUNDS of Blue Springs, this spacious and airy condo will impress you with it's 2 bedrooms and 2 full baths, in-suite laundry, 2 owned parking spots -one underground and one open spot. Beautiful flowing layout with floor to ceiling windows in the living room. Newer appliances included. Move-in condition! Willow wells membership included. Taxes are $2,143/2015. ENJOY THE PEACE AND QUIET of Morningside Retirement Community! You will love the carefree lifestyle offered with the rec centre, pool, library, workshops and social outings! This lovely Kensington model is in move in condition and features a gorgeous main bath with glass walk-in shower, beautiful lighting and flooring, newer toilet and sink, spacious master bedroom with plenty of closets and ensuite bath,living room boasts gas fireplace, relaxing deck,basement waterproofed by Advanced Basement Solutions. Taxes are $1,216/2015. STROH HOMES PROUDLY PRESENTS this elegant bungalow boasting an open-concept great room with gas fireplace, rustic oak floors and walk-out to covered deck, gorgeous kitchen with granite counter tops and pantry with pull-out drawers, large master bedroom with convenient walk-in closet and luxury ensuite bath, and finished basement with rec room with fireplace, bedroom and full bath. Staircase from garage to basement, central air, air exchanger, much more! A GOOD PLACE To raise children! Located in desirable Westvale, this stately red brick home with double garage offers 4 spacious bedrooms and 3 baths including an ensuite with laundry chute, finished rec room and den, efficiently designed kitchen with pantry, dinette, and main floor family room. There are sliders from the dinette to deck and private treed yard. Roof replaced in July 2012. Garage door replaced in 2011. WELCOME HOME! Lot size is 46.000X103.4 X 53 X 108 and taxes are $4,036 / 2015. GREAT BEGINNINGS! Tucked away on a quiet street, this spacious semi boasts a large livingroom, separate dining room with sliders to a balcony, 2 full baths, finished rec room, lots of basement storage, and walk-out to private, treed yard overlooking greenspace. CHARMING! Taxes are $2,322 / 2015 lot size 30.000X96.36. WELCOME HOME! This captivating backsplit boasts a beautiful kitchen with granite counters and ceramic floors overlooking the dining area for enjoyable dinner parties with family and friends. The relaxing family room has a walk-out to the private yard. 3 spacious bedrooms and 2 full baths. Desirably located on a family friendly street. ENCHANTING! Taxes are $2,797 / 2015 and lot size is 34.780X108. GROWING FAMILY? LOOKING FOR SPACE? You've found it in the spacious and well-cared for back-split boasting a double garage, 4 bedrooms, inviting family room with gas fireplace, bright kitchen with ample cupboards, separate dining room for easy entertaining, finished rec room with wood stove, lovely private patio overlooking the tranquil treed yard. THERE'S NO PLACE LIKE HOME! Taxes $3,552 / 2014 and lot size 50.000X115. MAKE YOUR MOVE! This pretty semi-detached home boasts a charming porch, living room with gleaming hardwood floors, bright kitchen with ceramic tiles, dinette leads to deck and private treed yard, finished rec room for the kids, 3 spacious bedrooms and 2 baths. BEAUTIFUL START! Taxes $2,532 / 2015 and lot size is 30.010X113.88 X 30.05 X 115.14. OPEN HOUSE SUNDAY 2:00-4:00! STROH HOMES PROUDLY PRESENTS this absolutely gorgeous bungalow with an outstanding kitchen featuring granite counter tops, huge island, spacious dinette with garden doors to a private covered porch, tranquil master retreat with inviting master spa bath with deep soaker tub, river rock in large shower, tumbled travertine marble heated floor. You'll love the spacious finished basement with 2 bedrooms, bath and bright family room. IT'S A SHOWPIECE! Lot size 62.110X128.61. BIG YARD- QUIET STREET! Cute and Cozy one and a Half storey home with large detached garage for the hobbyist. Bright updated kitchen open to living and dining room and walkout to deck, patio and private yard. THE BEST LITTLE FIRST HOUSE! Property taxes $2753/2014 & lot size is 33.000X165.00. THE PERFECT FIRST INVESTMENT! You'll love this pretty brick bungalow with its park-like yard and many pine trees. All windows and doors recently replaced. Newer furnace, central air, and tankless hot water heater. Desirably located close to St Mary's hospital, transportation and shopping. BEAUTIFUL START! BEAUTIFUL START! This sunny and spacious semi has much to offer including 3 large bedrooms, 2 baths, finished rec room, and deep fenced yard with shed. There have been many updates including the roof, furnace, central air, and most windows. Appliances included. Fabulous family-friendly location! Lot size 30.100X110 and taxes $2,439 / 2014. ADORABLE-AFFORDABLE! You'll love this 3 bedroom 2 bath home that's tucked away on a quiet crescent. It boasts a garage and double drive and private treed yard for relaxing summer barbeques. The finished rec room is perfect for relaxing with your family. THIS HOME OFFERS FANTASTIC VALUE! Taxes $2,863 / 2014. Lot size 31.000X133. CAN YOU USE A 4TH bedroom, den, office or sewing room? This family-sized home is tucked away on a quiet crescent. Built by Frank Reis, this attractive back-split offers welcoming street appeal, and boasts spacious separate dining room for easy entertaining, large kitchen and dinette with walk-out to deck and lovely private yard, spacious family room with cozy gas fireplace perfect for party entertaining, 3 full baths, and a finished rec room. LOW TRAFFIC STREET! Lot size is 65.000X125 and taxes are $3,357 / 2014. WHY PAY RENT? You can afford to own this adorable 3 bedroom bungalow townhouse boasting a garage, spacious living room with huge front window, bright eat-in kitchen with walk-out to private patio, gleaming updated bath, finished rec room, and large beautifully landscaped yard. Desirably located in Forest Heights, this home is in great condition and would make a very affordable first home or investment. BRING BACK THE SPARKLE! This attractive brick home offers excellent potential with a bit of work. The windows, furnace, and air conditioner have been replaced. There's a large pantry in the kitchen, and a main floor den/bedroom, plus 2 bedrooms up. BEAUTIFUL POSSIBILITIES! OLD AND QUAINT BUT UP TO DATE! Located in the heart of the city, it's close to everything! -the Center in the Square, library, museum, Farmer's Market -much more! You'll love the character of this classic mission style 3 bedroom home with gleaming hardwood floors, separate dining room awaiting the Christmas turkey, charming updated kitchen with appliances included, spacious family room addition with huge windows to let the sun in. Many updates-roof, furnace, windows, bath, kitchen, wiring, plumbing. Lot size is 43.700X110 X 30.9 X 110 and taxes are $2,412 / 2014. EXCEPTIONALLY GRACIOUS! This gorgeous 3 bedroom home boasts many special features including the soaring 2 storey foyer, warm and welcoming living room with gas fireplace for quiet visits, formal dining room with french doors, bay window and wood moldings for elegant dinner parties, sunny office by the front door, huge kitchen with ample cupboards open to the family room and overlooking the private patio, gazebo, beautiful yard and gardens. Enjoy the tranquility of the master suite with amazing spa bath. 2013 taxes are $3,433 and lot size is 85.0X0.37 acres. CAN YOU BELIEVE IT? A gorgeous 3 bedroom home in move-in condition with a double garage for this price? This home boasts a large bright master bedroom with 3 piece ensuite, huge main floor laundry room, attractive kitchen with pantry and breakfast bar, great room with hardwood floors with walk-out to relaxing deck. OPPORTUNITY KNOCKS! ADORABLE-AFFORDABLE! Why pay rent when you can afford to own this charming 2 bedroom condo desirably located in Uptown Waterloo overlooking parks and greenspace. It boasts low condo fees in a quiet well-run complex and is conveniently close to shopping, bus lines, expressway, universities and restaurants. This warm and welcoming home is in move-in condition and features a second floor master bedroom, in-suite laundry and inviting patio. SMART INVESTMENT! 2013 taxes are $1,928. BREAKFAST ON YOUR OWN PRIVATE PATIO OVERLOOKING THE BEAUTIFUL 1.24 ACRE YARD WITH TREES, ROLLING LAWN,FLOWERING SHRUBS AND GARDENS! You'll love this charming 4 bedroom vintage home that boasts 2 updated baths, all windows (except great room) replaced in 2009,warm and welcoming pine kitchen that your family will head for when they come home with abundant cupboards and counter space, and large sunny great room addition that overlooks the lovely yard and patio with its natural woodsy background. SUNSATIONAL! The 2013 taxes are $3601. ENJOY QUIET RELAXING SURROUNDINGS at this stunning 3+ bedroom home with dramatic 2 storey great room with floor to ceiling stone gas fireplace, spacious bright kitchen with abundant cupboards and counters, large master bedroom suite with his and hers closets and luxury ensuite, finished basement with bedroom, games room and rec room. Enjoy cool summer evenings relaxing on your private patio overlooking the picturebook setting of lawn, gardens and grounds and treed greenspace. The lot size is 71.13 x 147.64 feet and the taxes are $3952.25. GOOD FUNCTION AND GOOD LOOKS! This home has it all! Lovely updated kitchen and flooring, elegant separate dining room for easy entertaining, spacious master bedroom with luxury ensuite, finished rec room with gas fireplace for the kids and walk-out to private yard. Newer roof, furnace, air conditioning. Located on a quiet crescent in Forest Heights, this home has a lot size of 34.45 feet x 104.71 feet and the taxes are $3213. SOMETHING DIFFERENT! THERE'S NO PLACE LIKE HOME! Welcome to this gorgeous 3 plus bedroom bungalow with double garage that boasts an amazing kitchen with a bright and sunny eating area, breakfast bar and pantry with roll-out storage, and walk-out to the inviting deck for lazy summer afternoons. The master suite boasts a large walk-in closet and private master spa. You'll love entertaining in the living/dining room with hardwood floors and gas fireplace. And then there's the PARTY PLACE...fin rec room, games room, bedroom bathroom and more! The lot size is 62.080X126.64 X 46.77 X 127.95 feet and the 2013 taxes are $3700. BUY THIS LOVELY HOME TODAY! FRONT PORCH CHARM! There's lots to love in this lovely 3 bedroom, 2 bath vintage home including 2 gas fireplaces, cozy family room and den, bright and cheery updated kitchen, gorgeous great room addition by Murray Leis Construction, detached garage/shed for all your hobbies, and yards of yard with a pond, trees and perennials. The cistern is hooked up to the hot water lines for desirable soft water -the last water bill was $38.00! Lifetime steel roof, wired for a generator, ductless air conditioner. The lot size is 66.000X131.18, and the sq ft is 2083. The 2014 taxes are $2671. A SPECIAL PLACE! DREAM PLEASER! This elegant bungalow boasts an open-concept great room with gas fireplace and walk-out to covered deck, gorgeous kitchen with granite counter tops and pantry with pull-out drawers, large master bedroom with convenient walk-in closet and luxury ensuite bath, and basement can be finished for approximately $35,000. The virtual tour is from a previous build -this home must be built. You will be impressed with the quality craftsmanship in this remarkable home. Central air and air exchanger. WARM AND STRIKING DECOR is the focus of this spacious home and all the custom made window treatments are included. This luxurious 4 bedroom home boasts hardwood and ceramics, gorgeous kitchen with granite counter tops and loads of cupboards, elegant separate dining room, upper floor laundry, fully finished basement with a 3 piece bath, rec room, games room and an office with built-in cabinetry. Relax on the tranquil patio in the professionally landscaped and private yard. BEAUTIFUL FAMILY HOME! The lot size is 39.99 feet x 114.83 feet and the 2013 taxes are $4556.00. APPROX 4000 sq ft OF FINISHED SPACE INCLUDING THE BASEMENT. This gorgeous building lot is located on a tranquil inviting crescent in Wellesley. It's 49.21 feet X114.81 feet and backs onto green space. This is a RARE FIND! YOUR FIRST HOME! Are you wasting rent money? This charming home has much to offer including 3 bedrooms, 2 full updated baths, spacious and sunny country kitchen, newer windows, garage and lovely quiet location. Many updates! BEGIN WITH THIS! The lot size is 56.10 feet x 124.08 feet and the taxes are $2154.28. SPACE AND SUNSHINE! This family-friendly 4 bedroom home offers a sunny kitchen with ample cupboards and sliders leading to the deck and private yard overlooking greenspace. You'll love the separate dining room for elegant entertaining, spacious family room with cozy gas fireplace, and airy master bedroom suite with cathedral ceiling and luxury ensuite. It's desirably located on a quiet dead-end street. FANTASTIC VALUE! The lot size is 35.17 x 107.47 x 60.68 x 105.89 feet and taxes are $3615.95. QUIET ELEGANCE SPOKEN HERE! You will be enchanted with this gracious 2 bedroom bungalow that boasts a bright open-concept great room with gleaming hardwood floors , warm and welcoming kitchen with antique-glazed white cupboards and gorgeous porcelain tile floors and french doors to the patio, and an opulent master bedroom retreat complete with a luxurious spa bath. Located in Stonecroft's adult community with a spacious central rec centre, and built with energy saving and environment friendly Greenhouse builder standards. The lot size is 46 x 109.91 feet and the taxes are $3456.26. Condo fees are $136.50 and include garbage pick-up and membership to the rec centre. AN ABSOLUTELY STUNNING HOME! GROWING FAMILY? LOOKING FOR SPACE? You've found it in this 3+ bedroom semi-detached home located on a huge lot on a quiet crescent. The roof was just replaced and it boasts a single garage. There are 2 updated baths, and an inviting open-concept kitchen with breakfast bar. The finished basement has large widows to let the sunshine in. LARGE SUNNY BACKYARD! SHOWHOUSE PERFECTION! You'll be impressed with the quality craftmanship in this extraordinary 3 bedroom 1721 sq ft bungalow built by Stroh Homes. You'll love the beautiful great room with gas fireplace, gorgeous kitchen with granite counter tops ,pantry with roll-out shelving, and spacious dining are walking out to deck and gorgeous view of green space. The master suite has lots of windows, large walk-in closet and relaxing ensuite spa. The basement can be finished if desired, with walk-out to private patio. You'll love the insulated double garage, central air, and air exchanger. The lot size is 60.940X113.98 X 59.18 X 108.94 feet. This elegant home is available for immediate occupancy. THE RIGHT PLACE! This elegant home is in move-in condition and boasts a bright and welcoming kitchen with spacious dinette overlooking the private gorgeous yard and patio, open-concept family room with cozy gas fireplace and lots of windows to let the sunshine in, large master bedroom with ensuite, finished rec room for the kids with gas fireplace and lots of built-in cabinets for storage. THERE'S NOTHING TO DO! Roof was replaced last year and home has been beautifully updated and decorated. All appliances included. The lot size is 32.810X103.95 X 33.4 X 116.46 feet and the 2013 taxes are $3533. Tucked away on a quiet crescent in Waterloo, this 3+ bedroom brick bungalow offers 2 full baths, spacious finished rec room with gas fireplace, games room, den, sliders off of dinette to deck overlooking the gorgeous treed private yard. The 2013 taxes are $3173.00 and the lot size is 55 feet x 120 feet. BRIGHT AND CHARMING HOME! SO MUCH FOR SO LITTLE! This charming 3 bedroom brick bungalow is located on a private treed lot and boasts hardwood floors, bright kitchen with lots of cupboards and walkout to deck, spacious finished rec room with gas fireplace and walkout to tranquil yard, as well as a second bath, office and den -lots of space for entertaining. Relax and enjoy your morning coffee on the large front porch. COZY AND CAREFREE! The lot size is 52.500X132.14 X 63.1 X 130.26 feet and the 2013 taxes are $3003. GOOD FUNCTION AND GOOD LOOKS! Do you need a 4 bedroom home? You've found it in this gorgeous open-concept 2 storey with double garage boasting elegant kitchen with granite counter tops, spacious eating area overlooking the patio and fenced yard, relaxing great room, welcoming foyer with open staircase and soaring ceilings, private master suite with ample closets and luxurious ensuite. BEAUTIFULLY DECORATED AND READY TO MOVE IN TO! The taxes are $4616.00 for 2013 and the lot size is 36 x 99 feet. SHOWHOUSE PERFECTION! You'll be impressed with the quality craftmanship in this extraordinary bungalow built by Stroh Homes. The great room boasts 11 foot ceilings, an attractive gas fireplace, gorgeous kitchen with granite counter tops and walk-out to deck and beautiful view, master suite has lots of windows and walk-out,ensuite spa has in-floor heating, beautifully finished basement with walk-out to covered patio, rec room with stone fireplace, 2 bedrooms and bath. Insulated double garage, central air, air exchanger. EXCITINGLY NEW!! NEED A LARGE HOME? LIKE A FORMAL DINING ROOM? This home is perfect for your growing family and boasts a large living room and separate dining room with gleaming hardwood floors, huge kitchen with ample cupboards and a charming eating area overlooking the roomy family room with fireplace a walk-out to the private patio and lovely yard, 4 bedrooms and 2 full baths, and another level for all the storage you need. The lot size is 45 x 117.18 x 45 x 116.29 feet. The 2013 taxes are $3579.00 WELL WORTH A CALL! CELEBRATE NATURE! Located on 1.08 acres, this gorgeous custom built bungalow boasts a cozy family room with brick fireplace that your family will love and enjoy, separate dining room for Sunday dinners, elegant and spacious living room, beautiful kitchen with large dinette, and walk-out to newer deck overlooking the serene treed yard and gorgeous country sunsets. The roof was replaced in 2009, as well as a geothermal heating and cooling system installed. Located in the charming village of Millbank -POSTCARD SETTING - on a private winding crescent. The 2013 taxes are $3125.64. GARDEN ENTHUSIASTS! Located on a 1/4 acre of gorgeous rolling lawn, garden and trees, this sunny and spacious (2346 sq ft) 4+ ,2 bathroom home has many updates including almost all windows (last 18 months), roof in 2011, furnace, air conditioning and gas fireplace in 2002, front door replaced in 2012, rear deck,fence and shed in 2012, upstairs bath in 2012, much more! This home boasts high ceilings, and huge separate dining room for easy entertaining, spacious country kitchen to gather with friends, and large family room with cozy fireplace. The lot size is 82.5 x 130 and 2013 taxes are $2819. PICKET FENCE AND GARDEN GATE! This enchanting 3 bedroom, 2 bath home is in move-in condition and features large bedrooms, bright finished rec room for the kids to enjoy, and airy kitchen with sliders to a secluded patio surrounded by rolling lawns, flowering shrubs and gardens and trees that provide peaceful relaxation. Fantastic location close to schools and playgrounds. Central air conditioning, new roof in 2011, water softener, and updated baths are just some of the features of this tranquil home. The taxes are $2436/2013. THE BEST MOVE YOU CAN MAKE! MAKE NATURE YOUR NEIGHBOUR! You'll love the view of the greenspace beside and behind this lovely 3 bedroom bungalow boasting double garage, charming great room with gas fireplace and sloped ceilings, master bedroom ensuite, main floor laundry, and unfinished basement awaiting your finishing touches. FANTASTIC VALUE! The lot size is 59.06 x 127.96 feet and the taxes are $3314.08. THIS BEAUTIFUL AND SPACIOUS BUNGALOW HAS ALL THE "I WANTS" including a triple driveway, double insulated garage, main floor family room with cozy gas fireplace, lovely bright kitchen that will entice you to cook, huge master bedroom suite with room for anything, fantastic finished basement perfect for entertaining with a full bath, 2 bedrooms, large family-friendly rec room and bar. Relax in the sunroom overlooking the private patio and deep yard. This well-built home is immaculate! Furnace new in 2011, roof in 2006. The lot size is 86.53 x 130.35 feet and the taxes are $3856.96. ENCHANTING! GO AHEAD AND FALL IN LOVE...THIS TIME YOU CAN AFFORD IT! This bright and cheerful end unit townhouse boasts a newer furnace and air conditioner, newer kitchen counter, separate dining room, finished rec room, and 2 baths. There are sliders from the living room to the private fenced yard. Fantastic location close to the 401, expressway, Chicopee Ski Hill and shopping. Perfect starter home or investment property. DON'T RENT IT! OWN IT! Taxes are $1957, and the condo fee is $262.00 per month, and includes water. MAKE YOUR DOLLARS WORK! This licenced student dwelling is located close to the universities, buslines and shopping and is fully rented. It has a very efficient layout for student housing, with 5 bedrooms, 3 baths, and a common kitchen, dining room, and rec room. There is one underground parking spot with this unit, and central air conditioning. All bedroom furniture is included, as well as the dining room table and chairs. There have been many updates including 2 baths fully renovated, all new flooring on the main floor, and freshly painted. The condo fees are $336.00 per month and the taxes are $2425.00/2013. WON'T LAST LONG! CAREFREE LIVING CAN BE YOURS in this charming studio condo located in the heart of the city and just steps to the Centre in the Square, the Farmer's Market, library, museum. The kitchen and bath have been beautifully updated, and all flooring has been replaced. You'll love the great room with sliders to the patio. Fridge, stove, washer/dryer and microwave included. Property taxes are $922.66/2013, and the condo fees are $366.00 per month and include everything but water. NO SNOW TO SHOVEL! WARM AND WELCOMING best describes this beautiful 2371 sq ft home boasting a huge upper floor great room with ample windows to flood the room in sunlight, main floor office to allow you to work from home, cozy gas fireplace in the open living room, and charming wrap around porch to enjoy breezy summer evenings. It's located on a large 70.59 x 122.21 foot lot and the 2013 taxes are $3907.07. BE A LANDLORD! This end unit condo townhouse is desirably located close to both universities, shopping and bus routes. It boasts separate living quarters in the basement with a basement walk-out, main floor laundry, and overlooks many trees and rolling lawns. The condo fees are $305.00 and taxes are $2051.74. FANTASTIC OPPORTUNITY! GET THE MOST FOR YOUR MONEY! This sunny and spacious FREEHOLD TOWNHOUSE boasts a garage, 4 bedrooms, 2 baths, central air conditioning, desirable end unit with extra large lot! You'll love the large living room and cozy rec room. There's a separate dining room for comfortable entertaining, and sliders from the kitchen to the private and beautifully manicured yard. The lot size is 20.67 x 109 feet and the 2012 taxes are $2069.82. Lovely spacious townhouse condo in Village on the Green featuring 3 updated baths and updated kitchen. Large master bedroom with walk-in closet and ensuite. Cozy finished rec room with gas fireplace, and private patio. Appliances included. Desirable location close to universities, bus routes, and shopping. The condo fees are $336.00. The taxes are $2243.20. The square footage is 1502. HOUSE AND INCOME! This spacious century home boasts a 4 bedroom, 2 bath home and a 2 bedroom rental apartment to help with your mortgage payments! Or rent both sides! You'll love the character of the 3 porches, and the beautiful original staircase. The kitchen is spacious and bright and features a convenient dinette. There's a separate dining room for entertaining. Relax in the pool overlooking the private yard. Over-sized attached single garage and lots of parking. GREAT INCOME POTENTIAL! The lot size is 69.77 feet x 83.19 feet and the 2012 taxes are $2467.09. Zoning is Residential with one accessory rental dwelling unit. QUIET ELEGANCE SPOKEN HERE! Located on a huge 159 ft lot, this gorgeous home with double garage is sure to impress you its gleaming hardwood floors, open-concept living room and dining room, and there's no telling what you'll cook up in the newly renovated dream kitchen with granite countertops. A bright sun room leads to the multi-level deck and private rolling lawn, shrubs and your very own apple tree. There is a very spacious second floor family room, and the master bedroom boasts a luxury ensuite. There's lots of space in the finished rec room for the kids to hang out. the 2012 taxes are $3945 and the lot size is 56.33 x 159.71 feet. ENCHANTING! "QUIET FOREST HILL"! This lovely Obermeyer built home has only had one owner and has been lovingly maintained and is ready to move in to! Spacious finished rec room with gas fireplace, den and 3 piece bath down. Large bright living room, some hardwood floors, dining room with patio doors to 2 level deck and gorgeous park-like yard with many trees and perennials. Roof 2011. Newer furnace and air conditioning. Tucked away on a tranquil court. Taxes are $2889.00 for 2012 and the lot size is 48 feet x 119 feet. WON'T LAST LONG! A RARE FIND! Tucked away on a quiet treed Waterloo crescent, this dramatic 3 bedroom home boasts a Menno Martin addition with Hollywood staircase for a beautiful contemporary flow -perfect for entertaining! You'll love the spacious and bright kitchen with ample cupboards, luxurious baths, and 2 sliders overlooking the patio, lovely yard and tranquil gardens. This home features all hard floors including bamboo hardwood , and it's beautifully decorated and ready to move into! The lot size is 53 feet x 130 feet, and 2012 taxes are $ 3498.17. THERE'S NO PLACE LIKE HOME! TAKE LIFE EASY! 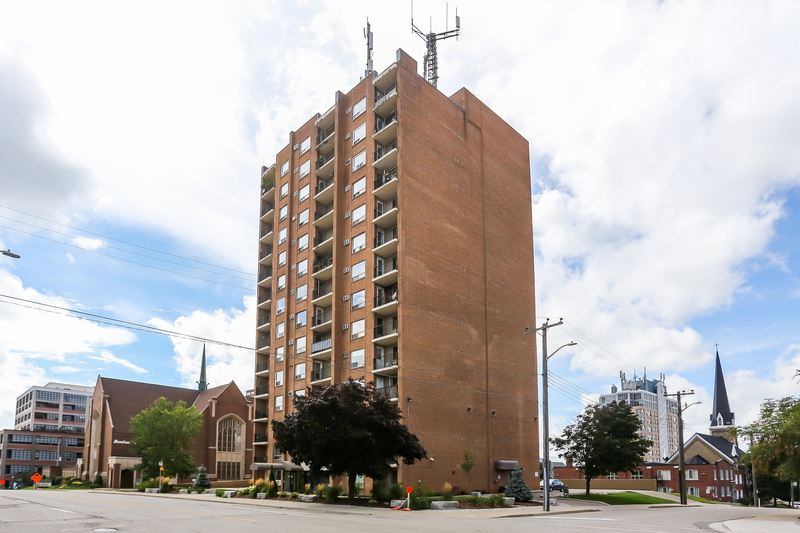 Enjoy the benefits of condo living at this popular building in Waterloo. It boast 2 bedrooms and 2 baths, bright kitchen with lots of cupboards, separate dining room, huge living room, and enclosed balcony. The condo fees include everything except for property taxes! (heat, hydro, and water all included). The condo fees are $471.74/month and the property taxes are $1730/year. Located close to the expressway, universities, bus system, and banks and grocery store. MOVE-IN CONDITION! TUCKED AWAY on a quiet crescent, this lovely townhouse was built in 2004 and boasts a gorgeous kitchen with island open to the great room, and sliders to patio overlooking greenspace. The spacious master bedroom has ensuite priviledges, and an upper level laundry for your convenience. You'll love relaxing in the rec room -just needs a ceiling. Single garage, central air conditioning, rough-in for central vac and basement bath. The square footage is 1258 according to MPAC. 2012 taxes are 2391.22, and the lot size is 18.04 x 104.38 feet. JUST MOVE IN! THE SIZE WILL SURPRISE YOU! This bright and spacious townhouse was built by Churchill Homes in 2007. The 'Larch' boasts 1633 square feet of elegant living space on multi-levels. The beautiful kitchen boasts lots of cupboards, appliances included, ceramic floors, and a dinette with sliders to the private yard with patio, shed, and backing onto greenspace. There is a main floor laundry, bath, separate dining room, and lovely great room. This home boasts central air conditioning, garage remotes, central vac rough-in, rough-in for basement bath, extra wide driveway, and gas line to the barbeque. NO CONDO FEES! The 2012 taxes are $2764.04 and the lot size is 23.1 feet x 96.2 feet. BEAUTY, WARMTH AND VALUE! SIMPLY ENCHANTING! You'll be impressed with this gorgeous 3+ bedroom bungalow with double garage. Walk out from your charming kitchen to a deck overlooking the rolling lawn, shrubs and perennials that provide peaceful relaxation. The basement boasts a huge finished family room with gas fireplace, bedroom and full bath. It has a walkout to a secluded patio and hot tub to enjoy lazy afternoons. It's tasteful decorating and immaculate condition invites you to move in. The 2011 taxes are 3309.40 and the lot size is 58.56 feet x 140 feet. ELEGANCE! ATMOSPHERE! This fantastic 1854 sq ft bungalow with double garage boasts 9 foot ceilings, an appealing open-concept design, and an attractive maple kitchen. The recently finished basement walks out to a patio overlooking greenspace. You'll love the spacious rec room with over-sized windows and huge games room. MOVE-IN CONDITION! The 2011 taxes are $4017.50 and the lot size is 49.21 feet x 107.08 feet. CHARM AND SUNSHINE AWAIT YOU in this open-concept bungalow with gorgeous newer kitchen and furnace, 2 full baths, 2 fireplaces, spacious finished basement. Relax on the secluded deck overlooking the private nicely landscaped yard and sparkling pool. Oversized garage. Beautifully decorated! The lot size is 78 feet x 84 feet and the 2011 taxes are $2485.75. YOU CAN AFFORD TO BUY...this gorgeous home because everything is done and you just need to move in! Beautiful new kitchen with modern cupboards and sliders to sun room and large treed yard. This home boasts 3 spacious bedrooms with a 4th downstairs, as well as a huge rec room with pretty fireplace and large window to bring the sunshine in. Both baths have been updated, as well as a new roof and chimney! Freshly painted, new fixtures and flooring! Central air conditioning! VERY IMPRESSIVE! The lot size is 50 x 115 feet and the 2011 taxes are $2902.78. The STARMIST by Decora Homes. Built in 1999, this beautiful open-concept backsplit has had many recent updates including the furnace (2007), air conditioner (2003), gas fireplace(2004), water softener(2007). ALL APPLIANCES AND WINDOW COVERINGS INCLUDED. The lot size is 33.99 FEET X 116 FEET. The 2011 property taxes are $3176. You'll love the great room with sloped ceilings that are open to the kitchen and dining room. The spacious family room boasts a gas fireplace and lots of room for entertaining friends and family. WARM AND WELCOMING! THE CASUAL LIFE! Located just a few minutes out of Kitchener, this picturesque century home is located on half an acre with a large heated detached garage and workshop. It boasts 3 bedrooms and 2 baths, central air conditioning, updated kitchen, spacious separate dining room, cozy finished rec room, and much more. THIS HOME IS IMMACULATE! The taxes are $2545.08 and the lot size is 106.26 feet x 200 feet. This ONE OF A KIND country retreat won't last long -CALL TODAY FOR A PRIVATE VIEWING! HOME AND GARDENS! You'll fall in love with the sparkling in-ground pool (2006) and huge private yard. GARDENER'S DELIGHT! This charming bungalow was built in 1960 on a 63 x 160.32 x 75.74 x 202.36 foot lot. It boasts 3+ bedrooms, 2 full baths (one with a whirlpool), and hardwood floors. The roof and air conditioning were replaced in 2004. The garage was built in 2005 as well as the stamped concrete double drive. The kitchen and rec room windows were replaced in 2004. The taxes are $3240.70. A SPECIAL PLACE! QUIET ELEGANCE! You will be enchanted with this gorgeous 4 bedroom home. The open 2 storey foyer welcomes you into the great room with soaring ceilings and windows and engineered hardwood floors. Relax in the airy family room with beautiful built-in bookshelves and cozy gas fireplace. The exquisite kitchen boasts stainless steel appliances, granite countertops, and substantial cupboards. There`s a main floor office, and separate dining room. Vacation in your own backyard with the interlocking stone patio leading to the newer inground salt-water 16`x 32`pool! ALL YOU HAVE TO DO IS MOVE IN! The lot size is 51.73 feet x 122.21 feet and the taxes are $4959.00. SMALL TOWN-HOME AND PRICE! Located on a huge lot, (75 x 150 feet) on a quiet crescent, this charming bungalow boasts many updates including, the roof, eavestroughing, deck, flooring, furnace and central air conditioning. REMEMBER WHEN...homes had wide porches, high ceilings, gorgeous woodwork? This home has it all! The lot size is 160.91 x 100.79 x 147.39 and the taxes are $2118.37. The gas furnace is almost new, and the roof was replaced in 2008. CLASSIC BEAUTY! CHARMING AND ATTRACTIVE!! This gorgeous 3+ bedroom, 2 bath home is located on a quiet dead-end street by the school. Finished rec room, separate dining room, central air, central vac, hardwood on main floor,newer water softener,treed lot with large deck, many updates! JUST MOVE IN! The lot size is 66 feet x 90.78 feet. The taxes are $2396.87. THIS WON'T LAST LONG! SO MUCH FOR SO LITTLE! This freehold townhome boasts 1439 sq ft and was built my Monarch Homes. There is a monthly fee of $107.00 for road snow removal, garbage pick-up, and common area maintenance. You'll love the master bedroom with spacious walk-in closet, and ensuite. All aplliances are included, and there's central air conditioning. The living room boasts an open staircase to the finished recreation room with beautiful fireplace, and 4 piece bath. Taxes are $2848.71 and the lot size is 21 feet x 92.63 feet. JUST MOVE IN AND ENJOY! HOME PLUS INCOME DUPLEX! Located in the highly desirable East Ward, this very attractive duplex has 3 bedrooms, 2 baths, finished rec room, and walk-up attic on both sides. It's currently rented for $1100/mo plus utilities. Taxes are $2939.95 for 2010. The roof was replaced in 2009, and all the windows were replaced in the last 4 or 5 years. This home is in fantastic condition and boasts a maintenance-free exterior. VERY IMPRESSIVE! A PICTURESQUE PIECE OF HISTORY! This gorgeous "olde" house has been extensively updated while preserving all of the charm of the past. The diningroom has the original fireplace, and you'll love the beautiful wood staircase and original woodwork and doors. The spacious kitchen has been updated with huge windows overlooking the refreshing inground salt-water pool with all the 'bells and whistles'! Theres a finished recreation room with gas wood stove, hobby room, so much more! The lot size is 72 feet by 142 feet with double detached garage. 2010 taxes are $3063.48. THIS STRIKING CONTEMPORARY...has many features you will fall in love with. A gorgeous family room addition boasts sloped ceilings, lots of glass, and a gas fireplace. You'll love the huge kitchen addition that overlooks the private treed yard. The basement is finished with a walkout to the yard. This 2412 sq ft bungalow is tucked away on a private dead-end street. The lot size is 143 x 233 x 268. Taxes are $5489.00 for 2010. FANTASTIC FAMILY HOME! This 3 bedroom home has all you need with 2 bathrooms, garage, central air conditioning, nicely landscaped and fenced yard. The taxes are $2838.00 for 2010, and the lot size is 30 feet by 104.99 feet. MAKE NATURE YOUR NEIGHBOUR! You'll love the view of the greenspace from the side and back of this gorgeous 4 bedroom backsplit with double garage. Boasting 1812 sq ft, this custom built home has an open-concept great room and kitchen over-looking the family room with gas fireplace. The recreation room is finished with a pub-style bar to entertain your friends. There are lots of extras such as hardwood, ceramics, central air conditioning, central vac, air exchanger, and much more. There's nothing to do -JUST MOVE IN AND ENJOY! the lot size is 49.21 x 115.81, and the taxes are $3213.73. ENCHANTING WOODLAND ESTATE LOCATED MINUTES FROM KITCHENER! Retreat to this gorgeous bungalow located on 6.64 acres with a pond, stream, and lots of trees. The taxes are $4348.00 for 2009. The newly updated rec room boasts a new gas woodstove, ceramic floors (most heated), huge new windows, and a walk-out to a patio and beautiful private view. You'll love the spacious kitchen with ample cupboards open to the family room with gas fireplace and sliders to another deck overlooking the wooded setting and pond. The master bedroom and bath have just been gloriously updated to provide a soothing oasis and comfort at day's end. A CAPTIVATING RETREAT! YOU'LL FALL IN LOVE WITH "The Pinestone" built by Monarch Homes in 2006. This 1640 sq ft townhouse boasts gleaming hardwood floors and a gorgouse gas fireplace in the great room, beautiful upgraded kitchen with ample cupboards and walk-out to private patio, spacious master bedroom with walk-in closet and luxurious ensuite, upper floor laundry room, finished rec room, and everything is immaculate! DON'T WASTE TIME- CALL TODAY TO VIEW! Taxes are $2992.79, and the lot size is 31 feet x 92.63. FANTASTIC FAMILY HOME! Located on a beautiful quiet crescent, this 4 level backsplit boasts an updated kitchen, 2 full baths, and spacious family room with walk-out to private treed yard. The taxes are $2522.00 for 2009, and the lot size is 30.8 x 120.14 x 30.39 x 117.25. Call me today to view! CONTEMPORARY FLAIR! You'll love this spacious townhome that offers a large modern kitchen with sliders to a private deck, main floor laundry, huge master bedroom, finished rec room with a walk-out to a treed yard. LUXURY WITHOUT UPKEEP! The square footage is 1412, and the taxes are $2985.88 for 2009. NEW PRICE! GROWING FAMILY? LOOKING FOR SPACE? You've found it in this gorgeous 3+ bedroom backsplit with double garage. The carpets are new, and you'll love the hardwood and ceramics. It boasts a beautiful, updated kitchen, and dining room overlooking the spacious family room. See for yourself!\x0d\x0aThe lot size is 53 x 122 and the taxes are $3372.00. NEW PRICE! HOME AND INCOME! This brick duplex has been lovingly updated with a new kitchen in the one unit, and an updated kitchen in the other unit. It boasts a detached double garage,lots of parking and spacious fenced yard. Taxes are $2930.58. The lot size is 50 feet by 119.97. The roof on both the house and garage was replaced in 2009. You'll love the gleaming hardwood floors, and it's been freshly painted. FANTASTIC OPPORTUNITY! New Price! JUST ONE LOOK! That's all you'll need with this lovely 3 bedroom home that's been extensively updated. It's situated on a child-friendly Waterloo culdesac and boasts a gorgeous private backyard woth lots of perennals. You'll love the bright kitchen, living room with fireplace and sliders to a cedar deck.The cozy rec room has a gas fireplace and built-in office. The basement also features a new 3 piece bath. Taxes are 2601.91 and the lot size is 23 x 104 x 60 x 110. PEACEFUL COUNTRY LIVING! This charming 3 bedroom home is located on 3/4 acres in scenic Wolverton. It boasts many updates including the roof, windows, kitchen, and furnace. There's central air conditioning, a gas woodstove, and calming hot tub. You'll love the double garage, and 2 newer storage sheds. Taxes are $2156.00 and the lot size is 126.2 x 144.16 x 124.6 x 144.78. NEW PRICE! DON'T RENT IT! OWN IT! This "cute as a button" brick home has had only one owner, and has been lovingly cared for. It boasts original hardwood floors, 3 bedrooms,garage, and a deep private lot with your own pear tree. Taxes are $2229, and the lot size is 42 feet by 120 feet. YOU WILL BE IMPRESSED! OWN A BIT OF THE AREA'S HISTORY! Nestled on a quiet, tree-lined street close to downtown, this gorgeous bungalow will captivate you with its charm and dignity. Beautiful gumwood trim, hardwood floors and baseboards, original doors...much more! The roof was replaced in 2007, windows in 2002/03, and the furnace in 2002. There is central air conditioning, and a cozy finished rec room. You'll love the private yard with deck and hot tub. Taxes are $2723, and the lot size is 40 x 114. Call for a viewing today! This exquisite bungalow has been completely redesigned and renovated by Mike Feiler construction. You'll love the dream kitchen with custom maple cupboards by Tralee Kitchens boasting black granite countertops. The main floor bath will entice you with the huge soaker tub, and marble countertops. The showers feature beautiful river rock tiling. All the windows and doors have been replaced with Low E Strassburger and are under warranty. You'll love the pillars, crown molding and gleaming maple floors. There are Vermont Castings high efficiency radiant gas fireplace inserts upstairs and down. The home has been re-insulated with R20 in the walls, and R50 in the ceilings. As well, all of the plumbing is new, and the heating system has been replaced. This home has an EnerGuide rating of MOST EFFICIENT! VERY IMPRESSIVE!! TREE-LINED LANEWAY! Tucked away on a quiet crescent, this vintage home boasts much charm and character with hardwood floors and wainscotting, and beautiful front porch perfect for relaxing. You'll love the large kitchen, 2 baths, main floor laundry, much more! There's an old-fashioned barn, and private treed yard backing onto greenspace. Taxes are $2121. Lot size is 72 x 132. PEACEFUL COUNTRY LIVING! Nestled on a private treed half acre lot on a quiet court, this gorgeous 4+ bedroom home has been extensively updated including the roof, furnace, almost all windows and kitchens and baths. There is a huge master bedroom with elegant new ensuite bath, sumptuous kitchen with high ceiling and skylights, and an amazing guest suite downstairs with separate entrance, beautiful new kitchen, newer 3 piece bath, bedroom and family room with fireplace. Taxes are $3812.00 ALL THIS CAN BE YOURS! New price! MEMORABLE! You'll be enchanted with this gorgeous home with family room with gas fireplace, bright finished rec room, bedroom, and 3 piece bath downstairs, meticulous open-concept main floor with sliders to maintenance-free deck and an impressive yard backing onto greenspace. WHERE EVERY SEASON IS BEAUTIFUL! Taxes are $2488.00 NEW PRICE!! This home was built in 1999. BEAUTIFULLY DECORATED AND READY TO MOVE IN TO!! CONVENIENCE, PRIVACY AND SECURITY can be yours in this charming 2 bedroom, 2 bath condo. The kitchen cupboards have been updated as well as newer ceramic tile. All appliances and air conditioner are included. Taxes are $1535.00. The condo fees are $463.71 monthly, and include heat, hydro, water and indoor parking spot #B12. Most furniture for sale, as well. CALL TO VIEW TODAY! ENJOY QUIET RELAXING SURROUNDINGS with this gorgeous 4 bedroom home situated on a 3/4 acre lot with sparkling in-ground pool, and backing onto farmland. GROWING FAMILY? NEED SPACE? You'll find it in this captivating 4 bedroom home with many upgrades. Central air conditioning,central vacuum, updated roof and windows,furnace and air conditioning are just some of the updates you'll find. It's tucked away on a quiet crescent in Forest Heights, and boasts a spacious deck leading to gorgeous landscaped backyard, and shed with hydro. MOVE RIGHT IN! IT'S IN TO BE OUT! This gorgeous country home has been extensively updated including the roof, windows, furnace, kitchen and baths. The rec room is bright and cheerful with ceramic floors and a cozy gas fireplace. There are 2 spacious bedrooms on the second floor with walk-in closets, and the master bedroom is on the mainfloor with a beautiful ensuite bath with relaxing whirlpool tub. The kitchen boasts ample cupboards and counterspace to make meal preparation a breeze! You'll love the walkout from the kitchen to the deck overlooking the pool, private yard, and scenic view of the countryside. ONE OF A KIND! Directions: Follow Trussler Road towards Ayr, turn right on hwy97 (Cedar Creek), and property is on right. A BEAUTIFUL START! You'll be impressed with this lovely raised bungalow that features an eat-in kitchen with sliders to deck and large private yard, 3 spacious bedrooms, and a huge basement boasting a bright recreation room with built-in bar and wet sink, 3 piece bath, and a games room and office/bedroom. The fridge, washer and dryer are included. Double driveway parks 4 cars! SO MUCH FOR SO LITTLE! GO AHEAD AND FALL IN LOVE....THIS TIME YOU CAN AFFORD IT!! This amazing detached bungalow features an open-concept livingroom and kitchen with parquet hardwood floors, newer windows, central air conditioning, finished rec room, and situated on a large private yard. Washer, dryer, new water softener, dishwasher and built-in microwave all included! SO MUCH TO OFFER! SCENIC SETTING! This captivating bungalow boasts a spacious country kitchen with ample cupboards,2 full baths, huge rec room with sliders leading to deck, relaxing hot tub, and backing onto the Wellesley Pond. Call me quickly...this one is a winner! CELEBRATE NATURE! This gorgeous 3 bedroom bungalow with double garage boasts a huge country kitchen with sliders leading to a deck and a captivating view of the countryside. The livingroom is spacious with a large picture window and lovely brick fireplace. There is a finished rec room with woodstove and a workshop. The lot is 1/2 an acre, and treed and private. WHY RENT WHEN YOU CAN AFFORD TO OWN? This beautiful and bright condo is truly in immaculate condition! The condo fees include heat, hydro and water. There is underground parking, and an inground pool. The air conditioner, fridge and stove are included. This home offers very affordable living! Call or e-mail today to view! FOR THE SMART BUYER!! INVEST IN YOUR FUTURE with this solid tri-plex located on a quiet street in Waterloo. The hi-efficiency gas furnace was new in 2005, and the roof was replaced in 2006. There is a detached double garage with opener, and lots of room for tenant parking. There is also a separate storage shed. This home is in great condition with a lot of hardwood, and newer kitchen countertops. Included are 3 fridges and stoves - all less than 10 years old. Call or e-mail me today for the income and expenses. This is a smoke-free building! SO MUCH SPACE! Both the yard and home are spacious and well kept! Gorgeous 4 bedroom home boasting main floor family room with gas fireplace and French doors to 26 x 13 ft deck and private and perfect yard with pond and waterfall. There have been many updates including a hi-eff furnace in 2004, roof in 2003, all windows and doors replaced 2001 to 2003. The basement is finished with a cozy recrm with gas fireplace, sewing room or bedroom, and exercise room. This is an enchanting home - call or email me to view today! LIVE WORRY-FREE! Located in a peaceful retirement community, this gorgeous condo boasts a spacious master bedroom with ensuite bath and roomy closets, a second 3 piece bath, den or second bedroom, bright, sunny kitchen, and sunroom with sliders to a patio. THE VERY "NOW"EST! !This dramatic condo is located in the Kaufman building in downtown Kitchener, offering the ultimate urban lifestyle. It is 665 sq feet, and includes 5 new appliances, and central air conditioning. There is one bedroom, a loft, fantastic kitchen with granite countertops, in-suite laundry, and a balcony with a great view. You'll love the soaring ceilings, and bright sunshine! CAPTIVATING CONTEMPORARY! You will love the bright flowing space offered in this gorgeous home that boasts maple floors and kitchen, pillars, and airy great room providing even more space. The master bedroom has 2 walk-in closets and lavish 5 piece ensuite. Central air conditioning has been recently installed. This home has just been completely painted by a professional painter, and is in move-in condition. ONCE YOU SEE IT, YOU'LL WANT TO OWN IT! ALL THIS CAN BE YOURS! This fantastic home is loaded with features including central air conditioning, central vac, bright country kitchen with pine cabinets and sliders with plantation shutters to newer deck,and large private yard backing onto greenspace. It boasts a charming master bedroom with full ensuite bath a roomy walk-in closet. the basement is fully finished with spacious rec room, den/office and another bathroom. The roof was replaced in 2003, and the driveway re-sealed this year. ALL THIS CAN BE YOURS...CALL TODAY FOR A VIEWING! Style, quality and value offered in this beautifully decorated bungalow with huge rec room with built-in wet bar and cozy gas woodstove, sliders to deck off of kitchen, over-sized double garage. Freezer and fridge in basement included, as well as central vacuum and all attachments. Dishwasher is newer. Hydro for 2006 was $1049.59. Gas for 2006 was 764.95. AND DON'T FORGET THE HORSESHOE PITS! This homes shows beautifully! Fantastic value! 518 AIR MILES! HERE COMES SUMMER....YOU CAN GO SWIMMING EVERY DAY! Lovely backsplit with whirlpool in updated bath, beautiful re-finished hardwood floors, spacious rec room with fireplace, and sparkling inground po ol. Closing date is flexible. ATTENTION! FAMILY WANTED! Get the most for your money! Attractive backsplit semi with ceramic floors in foyer and kitchen, hardwood in dining room overlooking spacious family room with gas fireplace and sliders to large private fenced yard. There is a finished rec room as well as another bedroom on the lower level. \ Appliances included, except freezer. FANTASTIC FAMILY HOME! 1 bedroom unit in popular Bluevale Towers with heat,water and hydro included in condo fee.Hardwood parquet floors,bright kitchen. Fantastic location near shopping, bus stop, schools. Many amenities. Exterior concrete and siding. Parking underground @ 34B. CAREFREE LIVING CAN BE YOURS! Charming condo boasting enclosed pine balcony with scenic view of Waterloo. 1 bedroom unit, mirrored dining room wall and closet doors, 3 ceiling fans, appliances include d, eat-in kitchen, jacuzzi bath tub, , air conditioned. Show with confidence. Storage room. Furniture and appliances are included. Parking Space 67B on 2nd floor. SIP LEMONADE on the gorgeous wrap-around porch of this truly unique 4 bedroom home with 2 full updated baths, recently finished rec room, amazing updated kitchen, detached workshop backing onto Breithaupt Park! Roof replaced Dec/04.Ductless Air Conditioning.